With all of yesterday’s drama, I almost forgot to research an ad I saw in the Sunday edition of Spokesman-Review for a pie-in-the-big-sky culinary event introducing Upper Crust, a sophisticated Pie Camp featuring the “Pie Whisperer” Kate McDermott at Paws Up Resort in Greenough Montana. What? Pie Camp? Sign me up! My super talented cousin goes to knitting camp, certainly I should go to Pie Camp. Who is this Pie Whisperer? I don’t watch TV so I assumed she is someone of Food Network fame. Doesn’t “paws up” mean you’re dead? What kind of resort is this? Where is Greenough Montana? Let’s draw the line in the sand right there to show my ignorance and socio-economic class. Now that poor and stupid boundaries of this discussion are drawn, let’s continue, shall we? I started on Amazon to find Kate McDermott’s cookbook. If you whisper to pies, you should have a book. No book. Who is Kate McDermott? A Google search informed me that Kate McDermott is a reknown pie maker that the likes of Dorie Greenspan (one of my favorites) is quoted on Ms. McDermott’s Art of The Pie website (www.artofthepie.com), “I would do anything to take an Art of the Pie class from Kate.” I don’t know who Ms. MsDermott is, but she is obviously someone that I should know! On her website, she offers her regular crust and gluten-free options. Kerrygold butter seems to be her wingman. Ms. McDermott is a fellow Washingtonian from Seattle that has people bending over backwards to take her pie classes. Again, I need to go to pie camp! Next I Googled Paws Up Resort. Let me backpeddle here. Paws Up doesn’t mean you’re dead, it means you surrender to glamping in incomparable luxury and unspoiled wilderness. You know I’m a sleeping bag on the ground in a tent kind of camper. Though I love a great resort and have stayed at several, I’ve never glamped, definitely not like what Paws Up has to offer. Here I am hoping to win a blue ribbon and $10 prize for my pie at the county fair while serious money is being spent and people are travelling from all over to learn to bake pie. Really? Hmph! 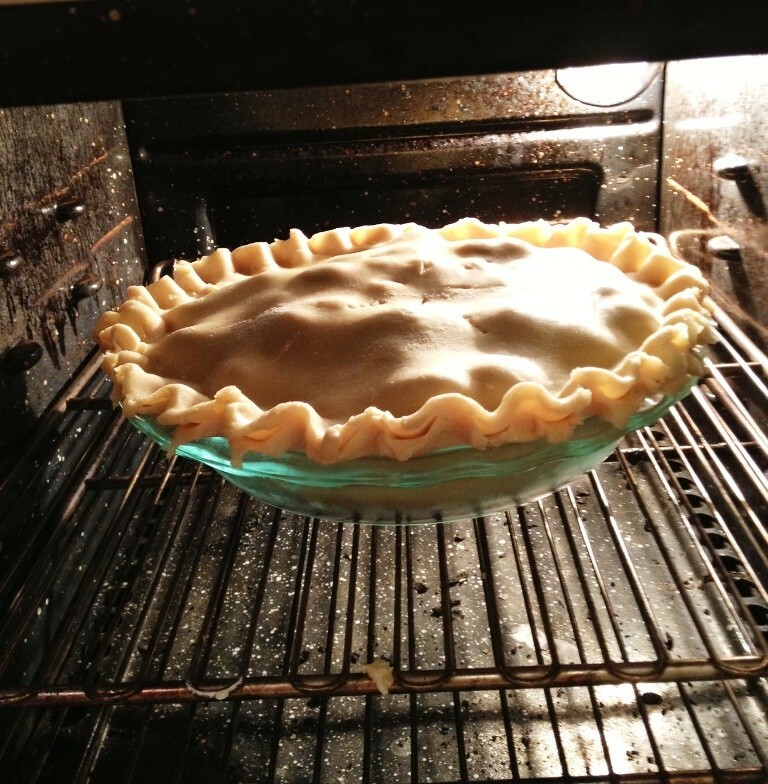 (Dear Boss, There is serious money to be made in pie…I may need time off to investigate. Wife of Boss, please share my thoughts, since he’s too busy to read my blog himself). Though I’m outclassed financially (bottom crust, not upper crust apparently), I came to the conclusion that I didn’t need no dang pie camp to bake me some pies. Some damn good pies at that, thank you very much. I stomped around the house tonight and squaked over the ridiculousness of the whole thing, then shut up and made a blackberry pie using the local Green Bluff berries we picked last month. My sweet as pie (today) seven-year old suggested “we” should make a pie every week. God love him! Of course, he quickly followed this up with the great idea to stuff as many Hershey’s bar into a pie and see what happens. I agreed to make a chocolate cream pie next, so our weekly tradition is now set in stone, with his dad’s eager agreement. I’m sorry, Ms. McDermott, I have no time to attend your camp, I’m too busy baking pies. Here’s the morale to my story: Cook for your audience. Though my pies may not be $5K worthy to the upper crust, my family loves them and that, my friends, is priceless.